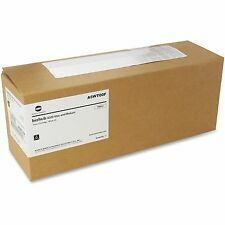 New Genuine sealed box of Konica Minolta TN511 Black Toner. One (1) Konica Minolta IU310Y (4047-501) - YELLOW. C350 / C351 / C450. GENUINE Konica Minolta Imaging Unit. · This is a GENUINE Konica Minolta part, NOT compatible or remanufactured. No exceptions. For use in BizHub printers. Konica Minolta bizhub C258, Konica Minolta bizhub C308, Konica Minolta bizhub C368. For Use in the Following Compatible Machine Models Remanufactured: No. Konica Minolta TN324 Lot. For bizhub C258, C368. (Part # TN-015, A3VV131, TN015 ). It's easy to reach us! Bizhub Pro 951. Yield 30,000 pages; For bizhub 25, OEM. Genuine Konica Minolta. Genuine Konica Minolta TN616C Cyan Toner For BizHub Press C6000 C7000 A1U9433. Condition is New. Shipped with USPS Priority Mail. Manufactured by Konica Minolta. Konica Minolta BIZHUB PRO C5500. Konica Minolta BIZHUB PRO C6500. Konica Minolta BIZHUB PRO C6500P. Capacity :Standard Yield. Yield :Black 39,400 / Colors 26,500. Bizhub Press C8000. It's easy to reach us! (Part # A1DY430, A1DY330, A1DY230, A1DY130, TN615C, TN615M, TN615Y, TN615K ). Konica Minolta PagePro 5600 5650 Series mono laser printer. Konica 122. Print Yield: Up to 19,000 Page Letter @ 5 % Coverage. (Open box for inspection only). Konica Minolta bizhub 454e, Konica Minolta bizhub 554e. For Use in the Following Compatible Machine Models Remanufactured: No. Konica Minolta bizhub C227, Konica Minolta bizhub C287. For Use in the Following Compatible Machine Models Remanufactured: No. Full set of 4 brand new OEM Konica Minolta YN312 toner. Includes C, M, Y, and K.
Part # DD1A002G3X. Konica/Minolta Bizhub 25E series laser printer. Location: Konica 300. Genuine KONICA/MINOLTA. For Use In Konica Minolta Magicolor 7400. Konica Minolta. Not a re manufactured, refurbished, or compatible. Picture is for reference ONLY! All major credit cards. P # 8937833, 8937824, TN501K, TN-501K/CF, 960903. forKonica Minolta 8050, Konica Minolta CF5001, Konica Minolta ColorFORCE 8050. Genuine Konica Minolta. series color laser printer. KONICA MINOLTA IUP23K (A73303F) Black Imaging Drum. Konica Minolta. Not a re manufactured, refurbished, or compatible. All major credit cards. MANUFACTURER: Minolta. PHYSICAL CONDITION: New, open box. SKU Number: 170377 | SN: . One (1) TN613K (A0TM130) - BLACK. One (1) TN613Y (A0TM230) - YELLOW. One (1) TN613M (A0TM330) - MAGENTA. One (1) TN613C (A0TM430) - CYAN. No exceptions. We will not mark any item as a “GIFT”. The boxes have mild shelf wear / mild dents. OEM KONICA-MINOLTA A33K332, ORIGINAL MAGENTA TONER CARTRIDGE. Condition is New. Shipped with USPS Priority Mail. Genuine Konica Minolta(IU610K) Black Imaging Unit, OEM. Genuine Konica Minolta. Konica Minolta bizhub C451. Konica Minolta bizhub C550. Konica Minolta bizhub C650. 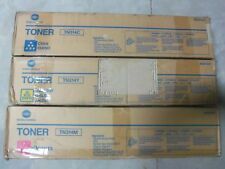 Lot Of 3- Genuine Konica Minolta TN-511 (24E) Black Toner Cartridge 32.2k. Condition is New. Shipped with USPS Priority Mail. TN610K TN610M TN610Y. Konica Minolta bizhub Pro C5500 Konica Minolta bizhub Pro C6500 Konica Minolta bizhub Pro C6500P. Konica Minolta Toner. 4 Magenta. See Picture for detail. It is what you will receive. Genuine Konica Minolta TNP34. Condition is New. Shipped with USPS Priority Mail. One (1) Konica Minolta DR710 Drum. GENUINE Konica. No exceptions. We will not mark any item as a “GIFT”. Manufactured by Konica Minolta. Konica Minolta BIZHUB C250. Konica Minolta BIZHUB C252. Konica Minolta NEC IT25C2. Konica Minolta NEC IT25C3. Capacity :Standard Yield. Yield :Black 20,000 / Color 12,000. KONICA MINOLTA DV-512K (A2XN03D) Black Developing Unit 590k. Konica Minolta. No exceptions. Make sure that it is filled in correctly. Box styles may vary from what is pictured. Genuine Konica Minolta. Konica Minolta bizhub PRESS C1100. 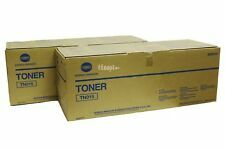 Box was at no point ever factory sealed, toner is new, and we also guarantee it to work!.